8. Blessed Orb - Rerolls the value on an item's implicit mod. 9. Chromatic Orb - Rerolls the colours on an item's sockets. 13. Orb of Augmentation - Adds a mod to a magic item with only 1 mod. 2. Would you rather spend 5 chaos on a level 30 item or buy a better level 40 item for 1 chaos? Depends! 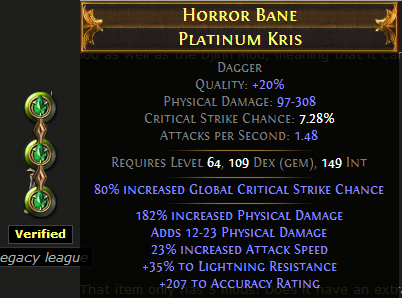 If you just want a decent upgrade over a decent item, 10 Chaos orbs or so might get you there if you're lucky. If you want the mother of all upgrades, be prepared to spend at least 40 GCPs or so worth of orbs to craft it. All craftable rares can have up to 6 mods. Of these 6, 3 will be prefixes while the remaining 3 will be suffixes. Not all mods can spawn on all items. For instance, movement speed mods can only spawn on boots. IIR/IIQ mods cannot spawn on chestpieces, weapons, belts or shields. Increased attack speed can only spawn on Weapons/Quivers, rings etc. In addition, not all mods can attain the highest level mod for every single item. For instance, the attack speed mod can reach 13% on gloves but only 7% on rings. The type of mods an item can have depends on it's itemlevel. Have a look at the above screenshot. 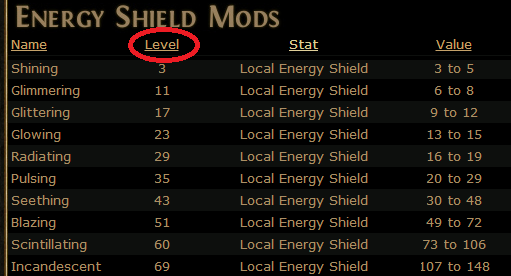 The circled "Level" indicates the itemlevel required to spawn that particular mod. For instance, an ilevel 69 ES gear can spawn all of the above mods. an ilevel 43 item however can spawn all of the above mods EXCEPT Blazing, Scintillating and Incandescent. 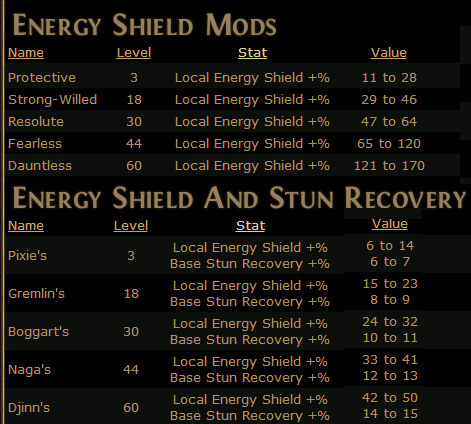 Certain mods may exist as prefixes or suffixes, for instance, IIR and %Increased Block and Stun Recovery. Before you craft an item, it is perhaps better if you quality it first. This ensures that you save on armourer scraps/blacksmith whetstones as it takes 4 Scraps/Whetstones to quality a white to 20%, 10 to quality a blue to 20%, and 20 to quality a rare to 20%. Usually applicable to the first two difficulties: Normal and Cruel. If you have a white item and need it to be better there are three things you can do. 3. Alch it and hope for a decent rare. In most cases early on in the game, using an Alch alone on an item and hoping for an upgrade is enough. There is not much point in wasting Chaos Orbs on low level items. However, if you want to craft the ultimate final upgrade, you'll have to end up being much more liberal with your orbs. Basically, you get an item that you want to craft, alch it then proceed to Chaos it till you get mods which you're happy with. This is the preferred method during mid to late-game when you just want any decent item that might be an upgrade. If you want to craft the ultimate item or if you're looking for specific mods however, it is advised to use method 2. At this stage, this will be a magic item with 2 mods, one of which will be a prefix and the other will be a suffix. Step 3: Does it have a mod that you're looking for in particular? If not, use an Alteration orb on it till you get the mod you're looking for. If yes, proceed to Step 4. Step 5: Out of the 3 mods it now has, does it have the two mods that you're looking for? If not, use an Orb of Scouring on it and start all over again from Step 1. If yes, congratulations! Proceed to Step 6. Step 7: Exalt it three times. Step 8: Did the 3 exalteds turn out well? If so, proceed to Step 9. If not, use the Eternal Orb to restore it and go back to Step 7. Step 9: Can the mod values be rolled higher? Use a Divine Orb! No idea how? Check the "How to use a Divine Orb" section below! As you can see, this method allows for greater control over the mods that you want on your item. It is probably the best method if you want to craft the ultimate defensive gear such as chestpieces, headgears, shields as pretty much the main mods you want for these pieces are the two prefixes: %Increased defense and +defense value. In addition, these pieces tend to have fewer types of possible mods, making it relatively easier to get the mods you want within the trans/aug and subsequent regal. Weapons and hybrid weapons in particular can spawn a much higher number of possible mod types, hence I usually just play the Chaos game on them. Although if you have enough alts/regals to spend, you can of course try that as well. This is where Jeweller's Orbs and Orbs of Fusing (the bane of every crafter) come in. The number of sockets an item can have depends on its item type and itemlevel. The chances of getting better links can be improved by quality-ing the item with Armourer Scraps or Blacksmith's Whetstones. 1h Weapons/Wands and Shields can have up to 3 Sockets. Quivers cannot have any sockets. Headgear, Boots and Gloves can have up to 4 sockets. Chestpieces can have up to 6 Sockets. Jeweller Orbs work by randomly reforging the number of sockets on an item. For instance, if you have an itemlevel 50 Chestpiece, each time you use a jeweller Orb on it will give you a random chance of getting 1-6 Sockets excluding the already pre-existing number of sockets. The number of links an item can have, as well as the number of possible combinations of links it can have depends on the number of sockets it has. For instance, if you have an unlinked 2S item, you have a 100% chance of fusing the 2 sockets together, since that's the only probable result that excludes the current item state. If you have an unlinked 3S item and you fuse it, you then have a 33% chance of getting a 2L + 1S, a 33% chance of getting 1S + 2L, and a 33% chance of getting a 3L. As you can see, the higher the number of sockets on an item, the lower your chance of linking all the sockets together. Don't be deceived by the name Orbs of Fusing, they may as well just be Orbs of Unfusing (a common in game joke). This is because they do not add links cumulatively and can remove links as well. 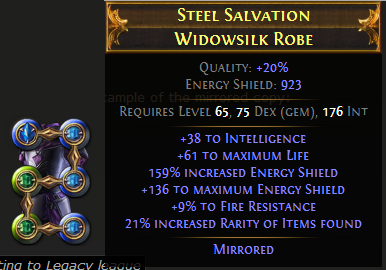 The holy grail for most crafters is to be able to fuse 6L items. My advice: don't get too overtly obsessed over it. 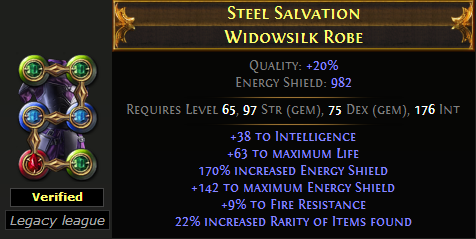 5Ls are hard enough to get as it is and are usually good enough for most builds. I find that the below animation created by Stickymaddness is the best example of how Orbs of Fusing will work on a typical 6S item. There is not much point in trying to socket/fuse low level items to get 4Ls. You'll find it far cheaper to just find white 4Ls and using an alch on them. It might be a good idea to use 1 fusing orb on a 6S (white) item you find, because MIGHT get a 5L/6L, and even if you don't, you can sell the 6S to a vendor for 7 jewellers, which is still a net profit of 3 jewellers. There are 3 different colours of sockets that can exist on items. Red represents the Str attribute. Green represents the Dex attribute. Blue represents the Int attribute. You'll find that pure Str items tend to roll Red sockets more often, pure Dex for Green and pure Blue for Int. Hence, when you use Chromatic Orbs, please be realistic! Let's say you have a Coronal Leather (which is a pure dex piece), the odds of you rolling 5 Red Sockets on it are minuscule. It could take you as many as 1000 Chromes and still not be able to get those colours! They can exist, I have seen before a pure dex item with 5 red sockets belonging to Erenor but it is extremely expensive to achieve. this item although a pure Int item only has 4 non-blue coloured sockets on it and it took me more than 400 chromes just to achieve this particular colour combination. Oh no! Does this mean that if I am an ES Int user and I need 2R, 1G and 1B, I have to resort to using a Str based Armour item which is totally irrelevant to my class? Ans: Thankfully, No. This is where Hybrid Items come in. Hybrid items are items which have 2 kinds of attribute requirements. For instance, Str/Int, Int/Dex, Str/Dex. It is generally much easier to roll colour combinations which would otherwise have been very tough on pure attribute items on hybrid items. Hence, although crafting is very much about luck and RnG, there is an element of common sense to it too! 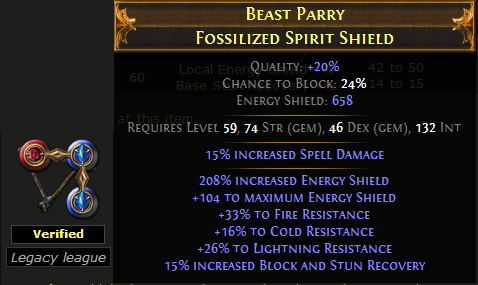 Question: Oh man that item only has +9 Energy Shield. I'd like to use a divine orb on it to roll +106! Can I? Take a look at this screenshot again. 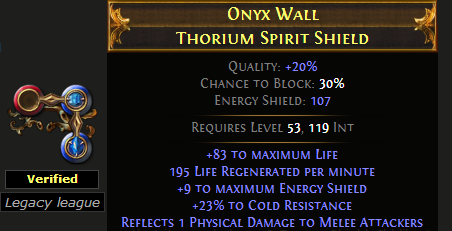 Hence, if you divine the above-mentioned shield, you will only get a maximum of +12 ES. If you notice this item, it has +142 ES which lies within the Incandescent prefix. If you divine it, sure it might hit +148, however, it might also go down to as low as +107. In addition, it might roll the 170% Increased ES to as low as 121%. Even if you do manage to roll +142 to +148, the 170% might roll down to 130% making the overall ES lower than it used to be. Once again, although crafting is very much about luck and RnG, You must also know when to take a gamble and when to stop. They can reroll the values higher or lower. Not all items have implicit values that can be rerolled. For instance, most shields EXCEPT Spiked Shields have fixed implicit values. Most weapons such as daggers, swords, rapiers have fixed implicit values as well. The only exceptions to the rule are Wands. 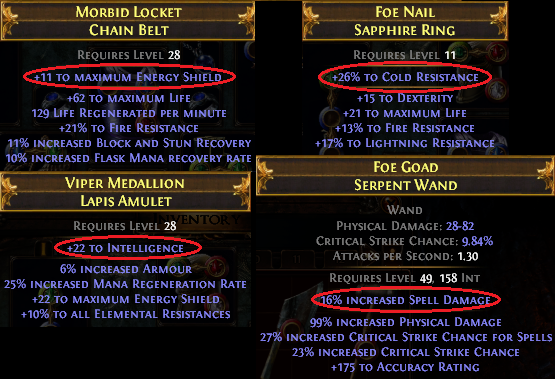 In terms of Chestpieces, Astral Plate and Occultist Vestments can have variable implicit values and can be rerolled with a blessed. Wait, you mean.. it's actually possible?! Yes it is! However the chance of you crafting one is very low. You can craft a unique by using an Orb of Chance on an item with a unique counterpart. For instance, if you chance a sapphire ring, there is a slim chance you might get Dream Fragments. If you chance a Heavy Belt, there is a chance you might get Meginord's Girdle. Even if you don't manage to turn the item into a unique, you might still end up getting a pretty good magic/rare item. For some high level uniques which exist only in very high level maps, some players prefer to keep repeating the cycle of using Orbs of Scouring and Orbs of Chance on the white item counterpart of the unique. This is the most expensive orb in the game. It basically duplicates any non-consumable item in the game. It can vendor for 2 Exalteds, 5 Regals and 1 Divine. 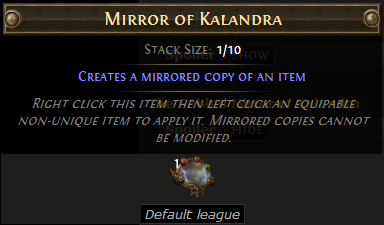 If you do use a Mirror of Kalandra on an item, the mirrored item will have the exact same stats as the original copy and it will not be possible to change the mirrored copy in any way, be it colour of sockets, links or stats. Therefore, before you mirror an item, make sure that the item has the specific colours that you need, or else you'll end up with a useless 6L chestpiece that you can't use because the colours do not suit your skillset. The reason the two are different was because the mirror was used on the original before the original subsequently had its stats divined up and its colours changed. Lastly, just for laughs, here's a video of Mirror of Kalandras in action. Now take a look at this item. Question: Didn't the screenshot say that the maximum %ES is 170? Why in the world does that item have 208% Increased ES? Answer: Some prefixes exist as double mods. For instance, in this shield's case, it has the Dauntless Mod as well as the Djinn Mod, meaning that it can go as high as 220% Increased ES. Question: That item only has 5 mods! Does it have an extra slot for an Exalt bearing in mind that Rule Number 1 says that crafted items can have up to 6 mods? Answer: No this item cannot have an extra slot because it already has 6 mods! The dagger above has a combination of the Pure Damage scaling prefix as well as the Damage Scaling and Accuracy double mod prefix. In addition it has one of the accuracy suffixes. Hence there was actually one double mod prefix hidden in that dagger! 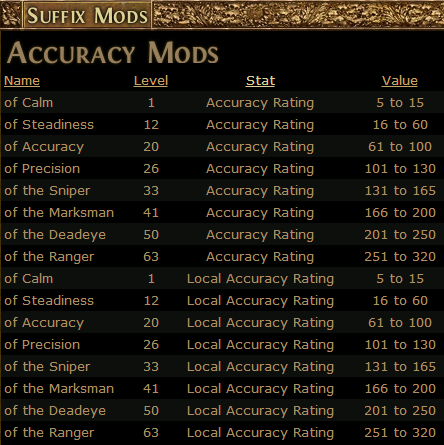 Question: Considering that item has a mixture of the Damage Scaling, Damage Scaling and Accuracy and Accuracy affixes, is it possible to tell what exact mods those are? 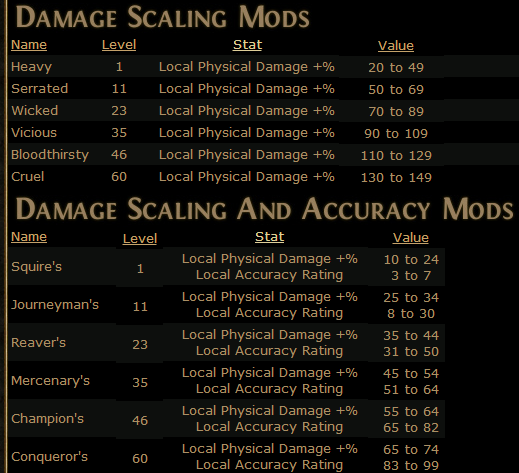 In other words, is the Damage Scaling mod Cruel or Bloodthirsty? Ans: In this dagger there are quite a few possible combinations, so it is pretty tough to tell. However in items such as the shield mentioned above, it is much more straightforward. Best of luck crafting people! Well done! But you forgot to mention how to craft fishing rod. Perhaps next time. I didn't actually read the whole guide yet, but I did notice you wrote 4 Suffixes. The last should be a prefix. Some good tips... and insane items! Terrific post kell, as always. People - bookmark this, if you don't craft now, you will one day. You have to have a particular slurms-like psychology to craft. It is a sure way to insanity, but enjoy the ride. PS Pity your 6L has crappy fire res, vendor it. Looks useful - my only suggestion is that you constantly switch between "mod" and "affix" when referring to mods, it would be useful to explain at the start of the post that the two mean the same thing, or standardise (preferably to 'mod', because that's the term we use). Will you be adding any way to see the exact mods and their names for a given item? Perhaps through a chat command?